Save $7 on day and night rides on the High Roller at the Linq Las Vegas. Additional discount options available on the offer page. Must enter promo code for the offer you wish to receive. This is definitely not your mother’s Ferris wheel. The High Roller at the Linq in Las Vegas is the newest attraction to hit the Strip. 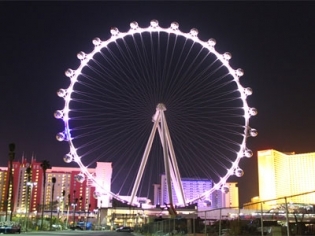 The enormous 550 foot observation wheel takes 30 minutes to make one full rotation and it can hold 1120 people. With 28 spherical, glass-enclosed cabins, the 360 degree views are breathtaking. You can rent an entire cabin for a wedding or a private party or simply fly solo to enjoy the sights. For privately rented cabins, they will roll a portable bar on board for the convenience of your guests. There are music and video shows and the 2000 LED lights on the High Roller make it a beautiful show in itself! Enjoy a drink from the Wheelhouse, which you can bring with you on the ride. The cabins are air-conditioned and valet parking is available too! Try the Chocolate Experience - Enjoy tasting handcrafted Ethel M Chocolates paired with your choice of Red or White wine on the 30 minute ride. Available every Thursday 5 PM – 8 PM, $45 per person. Also available is a yoga experience; for one hour practice with a professional instructor while taking in the sweeping views. Happy half hour experience is $40-$50 and is every day in special cabins from noon – 1 am; must be 21 to ride in these cabins. A MUST DO when in Vegas! We did the Happy Hour ride at night and it was awesome! We had about 15-18 people on our ball and the bartender was quick. 3 drinks and a shot in 30 mins…not too shabby ?. Buy your tixs online to save $5-7 a person. This was a little pricey for our liking but we had a lot of fun. You go so high in the air. If you like heights, this is perfect for you. At night the view is simply amazing. They didn’t charge us for our kids to ride so that was awesome. Check this out! I was a little scared to be going up so high on a ferris wheel. I was pleasantly surprised how relaxing the enclosed cabins are and love that you can drink up there too! Definitely a new sight to see next time you’re in Vegas. This ride means business and lives up to its name!